Hey there! Come on in, shake off your umbrella (we would have rain here on a party night), wipe your feet on the very-cute "Wipe Your Paws" mat, and welcome to Blog Party#14!! Tonight, it's all about the kids. It'll be loud and hot and crazy, but we'll just let the little ones run around while we, who are clearly so much more mature and dignified (ha!) congregate around the food. Seriously; your age doesn't have to still be a single digit to let loose and have fun, and it certainly didn't keep any of you from bringing some pretty fantastic kid food tonight! I mean it; I'm blown away at your creativity, and willingness to take this month's theme to heart. Ladies, you've done me proud. And while only a few of tonight's guests had kids of their own to use as guinea pigs, all the appetizers and drinks you'll sample tonight should find a home in your recipe boxes; at some point, there's probably going to be a child in your home. And trust me: they need to be fed (some kind of law, or something...). When you whip up these amazing appetizers and drinks for them, you will henceforth be called the coolest Aunt/Babysitter/Neighbor/Friend in the history of the world, believe me. So, let's set the stage with some kid-tested and approved table settings. Perfect for the kids (and for somewhat klutzy adults, as well...not naming names! ), these sturdy, three-compartment, melamine plates (scroll down the page) are perfect for loading up with small servings of all their favorite treats. We have several for Alex, and we haven't lost one yet. The dining table is covered in butcher paper, and there's a box filled with every color found in Nature (and many which aren't), so the kids can have fun writing their names and drawing faces while they eat. Keeping with the hands-on theme, Etch It Cups, available in red, clear and blue. No more "Where's my drink?" meltdowns! And we'll keep the little ones busy with their very own candy-making supplies, while we check out the food. That's right; I load them up on sugar, and you get to take them home! It's an age-old practice, no use trying to fight it. For the evening's music selections, I wanted something that would both appeal to the munchkins, and yet not make any of us want to perform a self-lobotomy (read: no Barney sing-alongs). 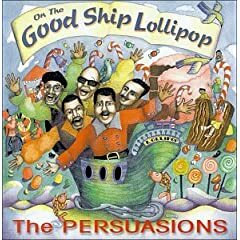 So, to start things off, the fabulous a capella stylings of The Persuasions, with On The Good Ship Lollipop. On those nights when Matt cooks, I'll sometimes find he's popped this one into the CD player! It's really that good. 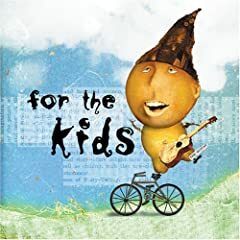 For something more contemporary, there's For the Kids, with kid-friendly tunes performed by the likes of Sarah McLachlan, the Lemonheads, Tom Waits (! no foolin'), Glen Phillips (lead signer of Toad the Wet Sprocket), Cake, and more. Sarah's version of The Rainbow Connection will positively melt your heart. 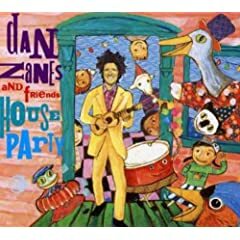 Also sharing time on the speakers tonight, it's Dan Zanes and Friends with House Party; just a fun disc. I get such a kick out of this guy! And now, let's take a look at your dishes! First guest tonight, it's Peabody! For our party, she's reached back in her memory (we'll do the polite thing and not ask how far!) 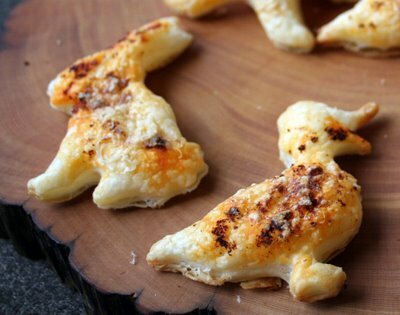 for those little animal cookies she had as a child. Using her family's recipe, Peabody's given us the most adorable Circus Cookies; they're just so darn cute, you'll want to eat them up, no matter your age. And because plain old milk, while perfect with cookies, just didn't seem festive enough, she's also brought Hot Chocolate(that caught a cold). I love it! Thanks for coming tonight, Peabody; now get ready to graze, 'cause there's plenty more to eat. Yay! Sara's here! Good to see you. 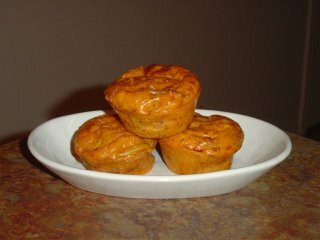 Not one to let the lack of small fry keep her from the party, Sara's made a big batch of Pizza Muffins; oooh...she's even used vegetarian pepperoni! Have I mentioned how much I love pizza? I see myself eating plenty of these, so if you want one? Move now. She's even provided some sweet stuff for the kids (right...because that's why we're here...uh-huh), with Worms and Dirt; chocolate pudding decorated with crumbled chocolate cookies, and candy worms! 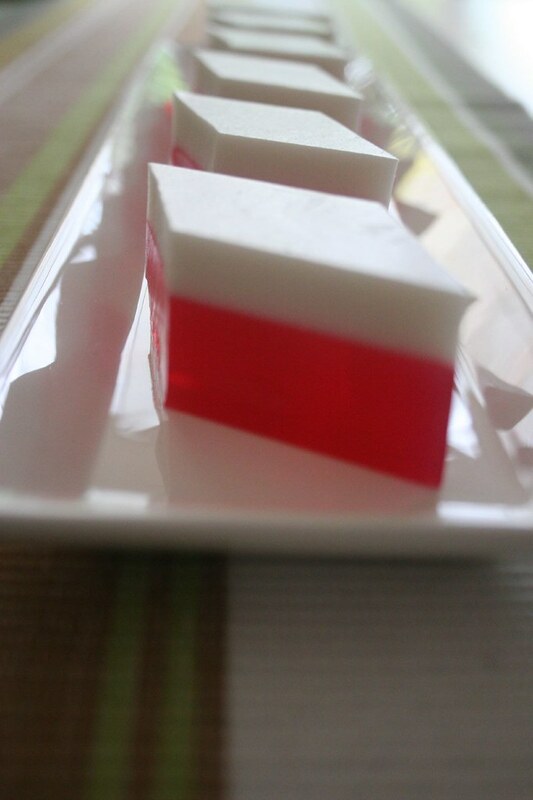 A perfect dessert for a small child. And don't forget the drink; the kids are probably dehydrated from all the running around, so Sara made Swamp Juice, a multi-pop beverage that's sure to spin them into a sugar coma! Perfect. Everything looks great, Sara, so glad you could make it. Next, it's Brilynn, with a very clever idea! I mean, what could appeal more to a kid than Chocolate Chip Cookies Kabobs?? It's cookies, on a stick. Brilliant. 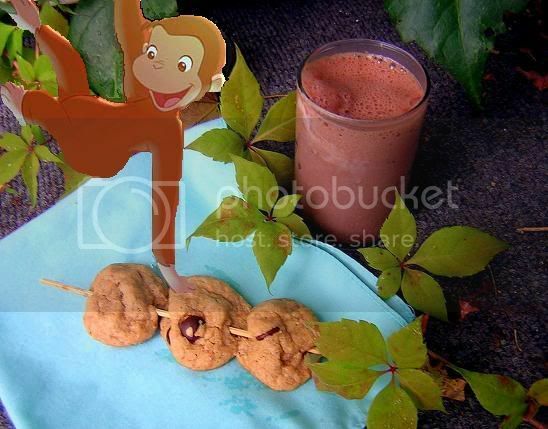 To help wash down those cookies, Brilynn's whipped up the funny-in-name-only, Monkey Milk; a nice thick shake made from banana ice cream, milk, chocolate powder and ice. Love it! Thank you so much for coming tonight, Brilynn! Look, it's Cin! Come on out of the rain, don't you know there's a Flash Food Warning going on? Let's get you in here, and dried off...and I'm more than happy to take those very cute Puff Pastry Animals off your hands...yes, hand them over, and no one gets hurt! Seriously, a blindingly simple idea, but clearly so very tasty. Great job, Cin...and I'm loving those cookie cutters! Here's Helene, and you are absolutely going to love what's she's brought for us! 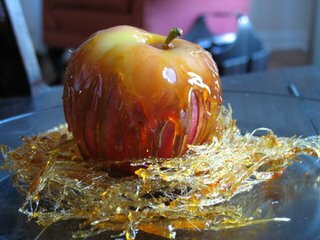 Turning to the classic fairy tales for inspiration, she's created Snow White Caramel Apples; beautiful spun caramel decorating gorgeous red apples. I asked for whimsical, and Helene delivered! She's also carted in mugs of Hot Chocolate, with whipped cream and a dash of nutmeg; sounds good to me. Helene, I'm very happy you could be here tonight! Jenni comes next, and I owe her a hug: anyone who can get as gung-ho about Blog Party as I do deserves it! The (said with fondness) crazy girl really went to town, putting together a pretty tasty menu for tonight, and we reap the rewards! She's brought cute little pastry cups filled with Mini Meatballs, the must-try Cheesy Polenta Fries, Oatmeal Cookies with tiny cups of Raspberry Ice Cream, and even a Kir Royale Mocktale! Wow, everything is fantastic...I'm not sure what to try first. So very happy you could be here tonight, Jenni! With a name like Barbie2Be, how could our next guest not attend tonight's party? Getting in touch with her inner-child, Barbie2Be made very yummy Tortillas Wraps (I have a strange fondness for these things, must be because my parents never made them), the kid-friendly Ants On a Log (I packed some in Alex's lunch last week! 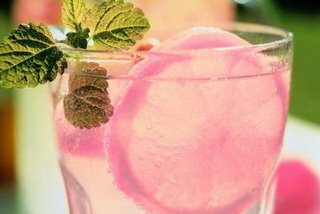 ), and some gorgeous Old Fashioned Pink Lemonade. It all looks so good! I'm calling dibs on the red tortilla wraps...thanks for coming! And here comes I-Ling...welcome! 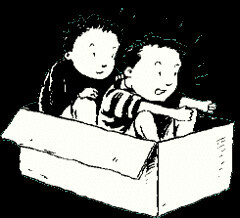 This may be a party for the kids, but I know we're all anxious to see what you brought with you! Oooh...take a look! I-Ling has cute little cups of Honey Joys (I can see a new addiction forming here), the beautiful Agar-Agar Santan, little Pigs in a Blanket, and Ham, Cheese, and Pineapple Mini Tarts. Wow...it all looks so good! Not forgetting the 'cocktail', or in this case, 'mocktail' part of our party, I-Ling's also mixed up some soda water with Ribena; now, I'd not heard of this before tonight, so I looked it up (god bless the Internet): it's a blackcurrant drink! Sounds good to me. So happy to have you here tonight! Hooray! Heather made it the party! Good to have you with us. 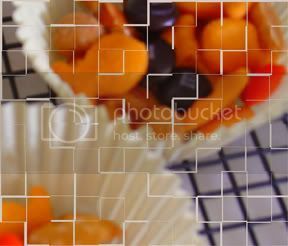 And I know we're all going to love Heather's currently-unnamed Snack Mix; a combination of Halloween M&M's (yes, they do make a difference...I bought them on impulse just the other day! ), pretzels and Goldfish crackers, and honey-roasted peanuts. I love snack mixes...always have...and this one's a keeper! Thank you for coming, Heather. Last through the door tonight, it's Ulrike...so glad you could make it; I know it's a long flight (and boy, are your arms tired...ha, ha). This month's Blog Party worked out well for her, as her son celebrated a birthday around the same time: let's all wish Ulrike's boy a very happy birthday, ok? 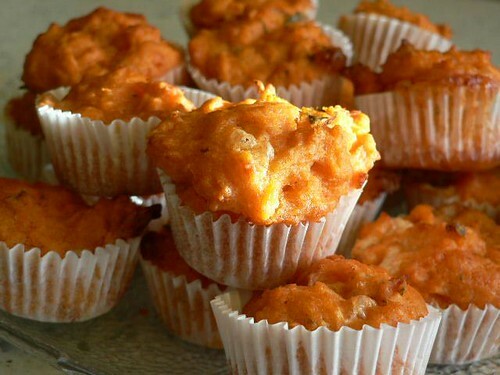 So, to celebrate both events, she's made some yummy Mini Carrot Muffins with Cheese...can't wait to try them! Ulrike's also brought a lot of Fruchttiger, which is apparently the thing to drink, if you're a kid...sounds good to me! Thank you so much for coming, Ulrike! I'm not sure what, exactly, happened. I can't blame it on intoxication because 1. this is a party for kids, and 2. I don't drink! I don't think she's the type to play wallflower, hiding in the corner, either. Well, I'm putting it down to party-planning stress, I suppose. Whatever the reason, it seems I've completely forgotten a guest! And I'm so terribley ashamed...this is not a common practice at Blog Party, you know. Without further ado, please give a huge 'I'm so terribly sorry I didn't see you' welcome to Johanna! And I was so very happy to see she'd found time to fit my little cocktail party into her always-busy schedule, so what do I do? Forget she's there! 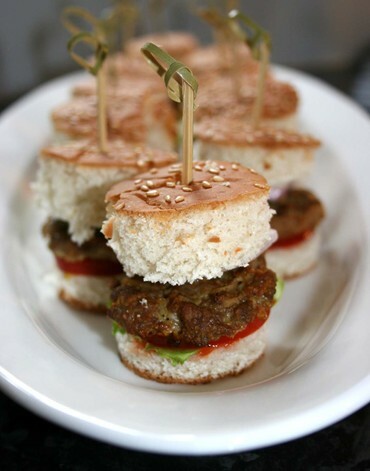 Well, I know you're all going to want to flog me with a wet noodle, because you almost missed on out Johanna's fab Mini-Hamburgers; perfect little gourmet burgers that kids will think are neat, and the adults will thank whichever god they pray to for a truly good burger! Johanna, please forgive me? I'm doing penance by tackling a grungy kitchen; say it's punishment enough?? And a big thank you for coming...don't let my miscue keep you from coming back again! I had a lot of fun with this one, I have to tell you. 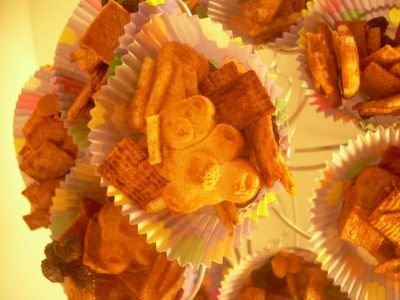 We'll start off with Teddy Bear Snack Mix; little graham teddies, with honey-graham cereal, potato sticks (is it wrong that I wanted to eat the whole can? ), mixed with (vegetarian) Worcestershire sauce, melted butter, brown sugar, and cinnamon, toasted in the oven for a few minutes, then mixed with raisins and peanut butter chips. Fun. 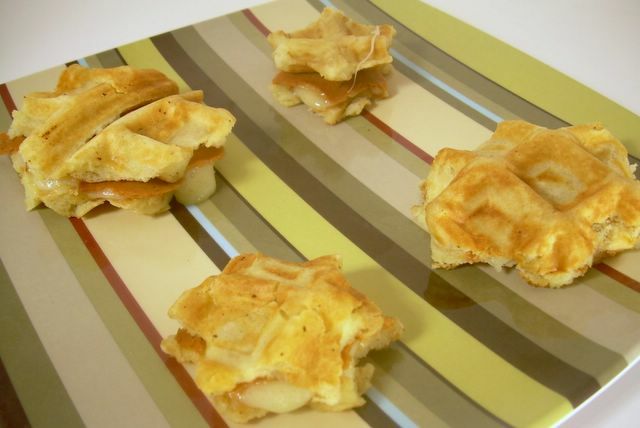 Next, Vegetarian Ham and Gruyere Waffle Sandwiches. Thinly sliced Gruyere, veggie deli slices, toasted between two full-sized waffles, then cut into shapes. Waffles? Toasted cheese? Cookie cutters? Hee. And of course, you can use the real thing here; we're 2:1 vegetarian in our house! What's more kid-friendly than mac & cheese? 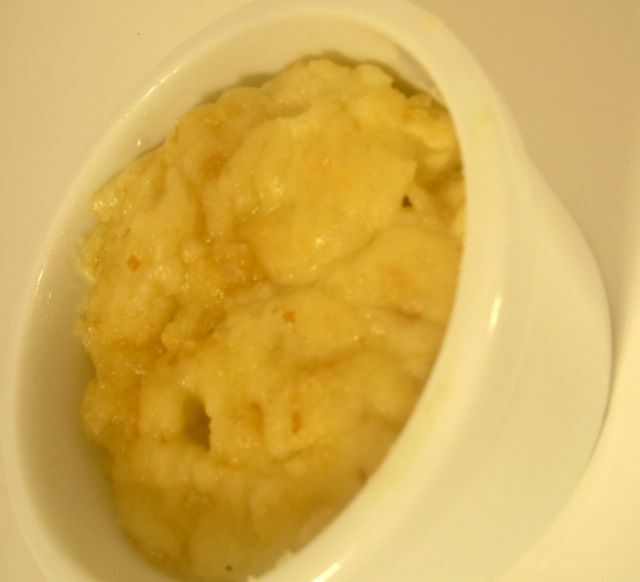 Here, cream cheese and white cheddar melted, mixed with elbow macaroni, then baked, with a crunchy bread crumb topping, and served in appetizer-approved ramekins. With all that cheese, I'm sure you'll need something refreshing to drink, so try this Raspberry Cooler. 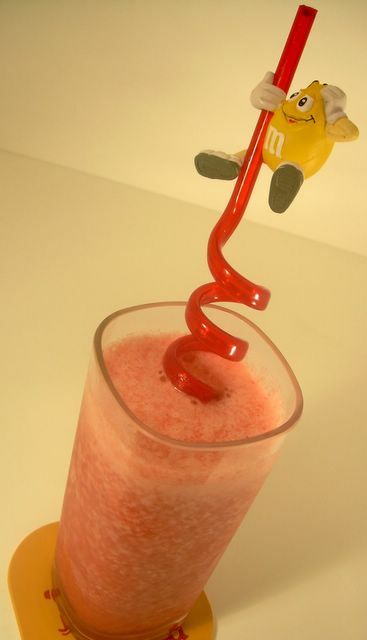 Pureed raspberries, shaken with pineapple, lemon and lime juices. Tangy, and the M&M's straw just makes it more fun. And of course there's dessert! Sugar cookie dough (my mom's secret recipe), pressed into a Springform pan and baked, then topped with 'tomato sauce' (red-colored frosting), then coated with 'mozzarella cheese' (white candy melts) and topped with red, green, yellow and orange 'peppers' (Dots), 'olives' (black licorice), 'anchovies' (Swedish fish), and 'tomatoes' (maraschino cherries). I can only hope you have half as much fun eating it as I did making it! Well, that wraps it up for tonight; I think we'd best get the little ones home before something breaks...be it pottery from the china hutch, or an ulna! A huge thank you to every one of you for really coming through this month: your appetizers, and drinks, were truly amazing! I'm beyond impressed. And in just eight more days, I'll be announcing the theme for October's Blog Party...I do hope you'll not only come back, but bring a friend! And this is unprecedented for Blog Party: I'm giving you a hint about our next theme: you'll want to dust off your (non-cook) book shelves!! I LOVED your write-up Stephanie...it made me laugh...you have a very nice sense of humor! And the variety of dishes here are AMAZING!!! Now this is one great party! Thanks for hosting this event, it's been so much fun to party with everyone else. And your cookie pizza is the best!!! I like to have fun with it...and you're right, we really did get some amazing dishes this time! I'm so happy you could come...all your dishes were amazing. 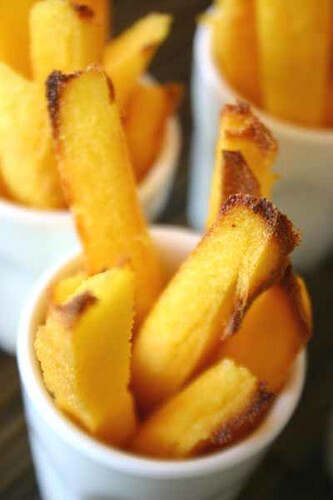 Matt and I really want to try those polenta fries. 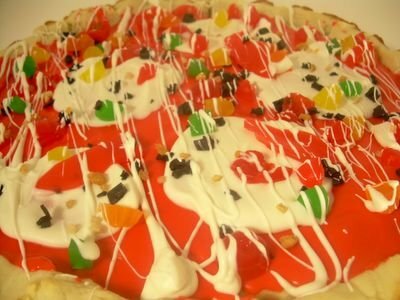 The pizza was so cool, wasn't it? Isn't that the best thing about Blog Party, though? We all walk away with new things to try! I had so much fun...it was a good theme, I think. Really? Me, I had one with a mopey-looking pup on it, and around the rim, the alphabet and the words "eat it up quick, or Grover will get it". Still have it, in fact. Stephanie: you got me hooked! It was fun to participate and I am looking forward to next month's party! 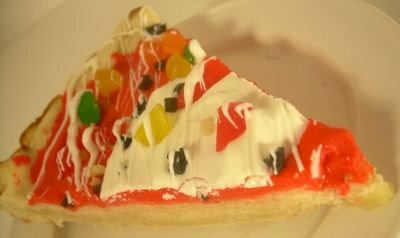 I love the idea of your cookie pizza! Yay, Helene! Good to have you on board...trust me, you'll love it. What a great collection of treats. Very nice writ-up, though... and what a fantastic party! I'm so sorry, I have no idea what happened (could be as simple as the 'star' on the message disappearing); I will correct that very soon! I've fixed it, and I'm still shaking my head over this one! Sorry, again! I think it's one of the best one so far...and it's even better, now that I've re-chardge my brain and added Johanna! thanks, stephanie, but I am used to being ignored ;-) I enjoyed the party nevertheless - fantastic recipes and a most amusing write-up! and of course i'll try and be there for the next round! Johanna; nobody puts the Passionate Cook in the Corner!! Thanks for understanding...I have to learn not to take on so much at one time, I suppose. We did get some incredible dishes; I can't wait to try them out on Alex.